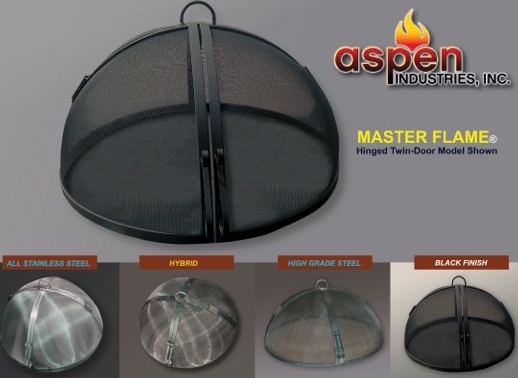 American-made Master Flame Fire Pit Screens can now be ordered in three types: High Grade Steel; Hybrid; and All Stainless Steel. This applies to Hinged Twin Door Round, Pivot Access Round, Lift Off Dome and Hinged Single Door Square, or Rectangular Fire Pit Screens. Fire pit screens cover and help prevent sparks and embers from ﬂying out—even in the wind. Helps prevent accidents, and contains incendiary sparks, ash and soot. Master Flame Brand made-to-order ﬁre pit screens are completely fabricated of welded steel—no rivets or screws are used.